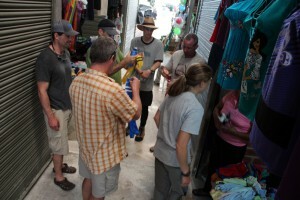 We had a fired up crew of boaters last week, and they were a cool group to watch progress. All of them had pretty strong Class IV skills and they are all pushing into the IV+ and even V realm. 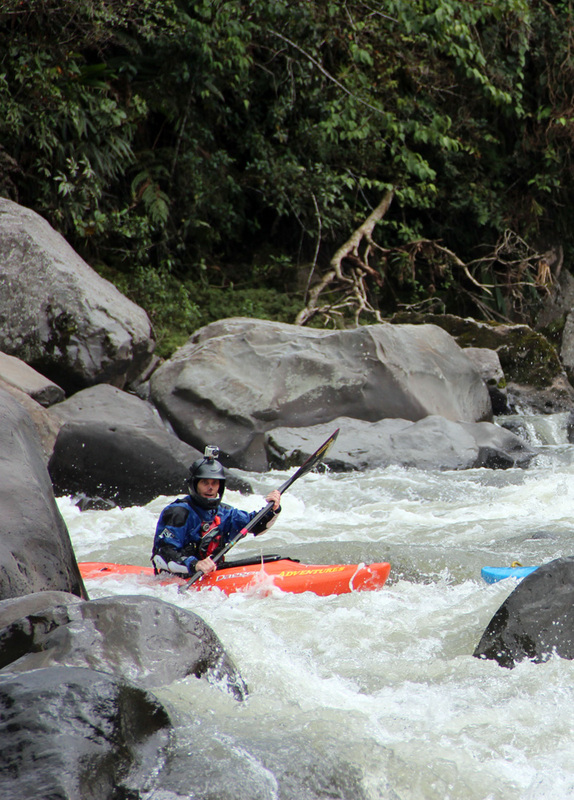 One thing we thought about this week was how valuable it is to go out and see new rivers to really push your comfort zone without necessarily pushing your skills beyond their limits. What I am about to explain holds true for ALL kayakers. 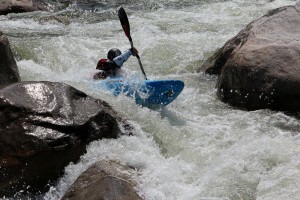 For those going from Class III to IV, or even Class I up to Class II; but I think it’s especially important for kayakers who are making the transition from Class IV to Class V. When you start talking about Class V, how you take that next step is extremely important and a decision that should be well thought out and planned. It’s one thing to progress from running Class II to taking your 1st plunge into a Class III rapid. It’s easy to find Class III rapids that are very safe. So, what the hell, go for it! If you mess up or swim, there is a good chance you’ll come through the experience relatively unscathed. 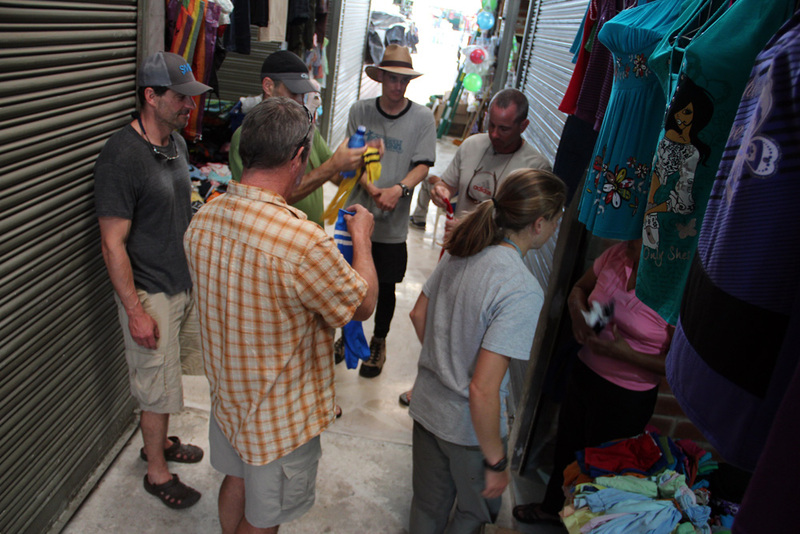 Darcy helping the boys pick out some very stylish soccer socks to give them a little protection from the ankle-biters (aka No-See-Ums) around Tena. 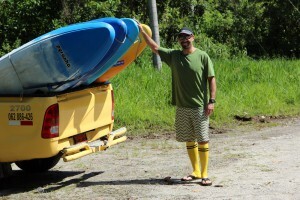 Luckily they settled it like gentlemen but I think the yellow pair was highly sought after! But that is definitely not the case when you are talking about a Class V rapid. The lines are hard to make and there are consequences—that is what defines Class V. So, it’s not always easy (or safe) to take the plunge into Class V. You want to make sure you are ready—both physically and mentally—for the challenge. Craig making his way down the Upper Piatua. 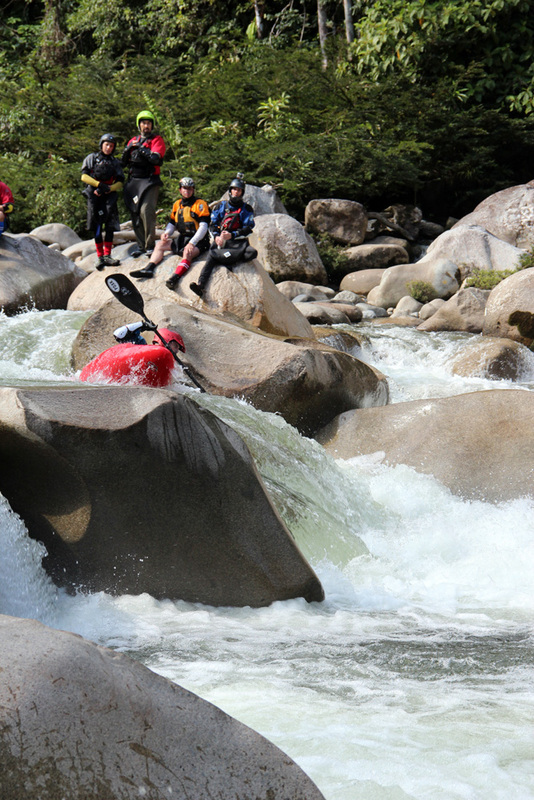 This rapids offers all the challenge of a VERY low volume, technical creek, but with the push of a bigger river. 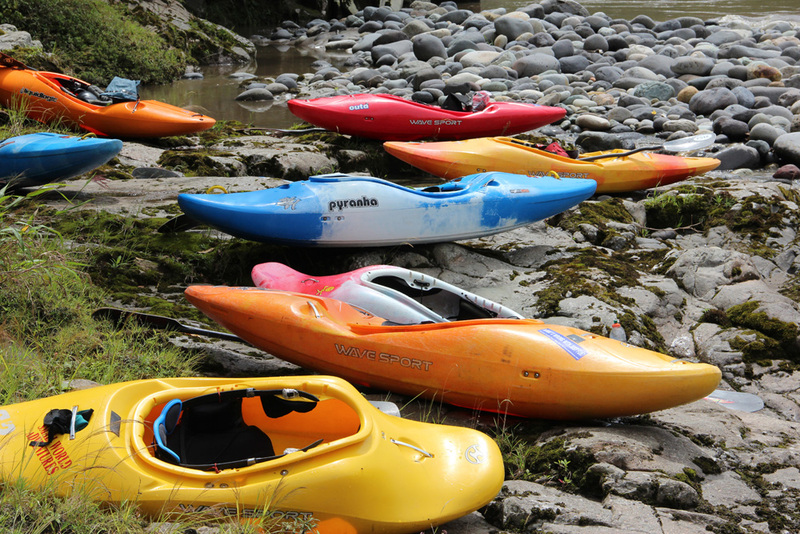 What we find can help a great deal is just to paddle a variety of different rivers in the Class IV and IV+ range. In reality, it’s great to do laps on your local Class IV run to hone in your skills, but once you learn every line, every rock, every feature, you are no longer learning or pushing your skills in a very effective manner. Steve showing off said socks. He even retro-fitted his pair so he could wear them with his flip flops and his Vibram “5 Finger” shoes. So seek out new rivers! You don’t have to come all the way to Ecuador to do that (although it is a great way to see a lot of new rivers in a short period of time). Travel throughout your home state or your region and do as many new IV/IV+ runs as you possibly can. Even if you are following people through these runs you will be amazed at how many new river features you can discover. When people show you the lines, you still have to do the paddling for yourself and you’ll be completely immersed in the new character of the river. If you aren’t following someone, you’ll have to work harder to read the water, read the currents, the features, and the geology. Each time you do this, you’ll learn something and become a better, more experience paddler. Wayne and Steve get to star in their own little “mini-video” segment. Together they highlight some of the variety we got to hit up on this week of Class IV rivers. I’ve paddled a lot of rivers in my 14 years of kayaking and no two are the same. Each river—even each section of river—will have something new for you. Whether it’s a differently shaped boof, crazy boils, reactionary waves, or waterfall with nice rolling take off, it’ll all be new. And we can learn a lot by exposing ourselves to new things! This will help you really dial in your skills while paddling out of your comfort zone (not necessarily paddling beyond your skill level, just out of the “home” comfort zone). 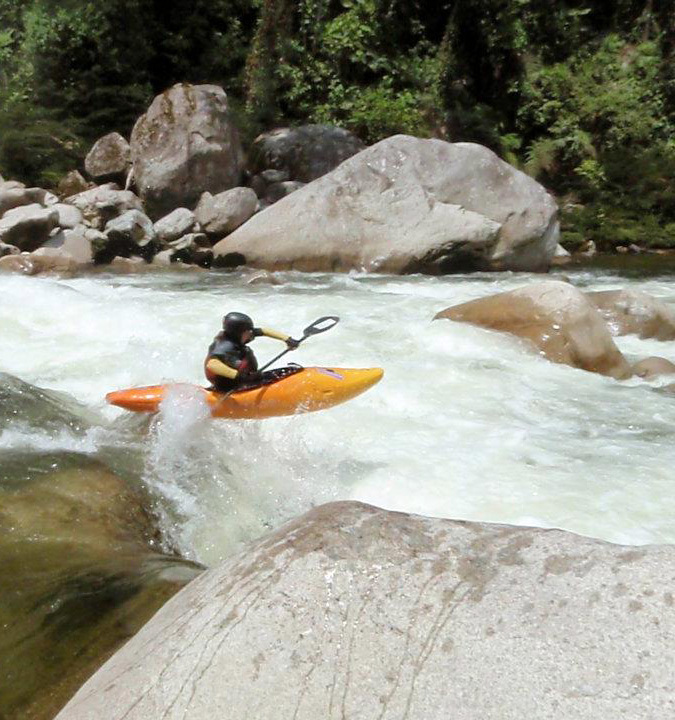 It’s easy to turn your brain off on your home run—paddle to river left, punch a hole, boof right, eddy out. 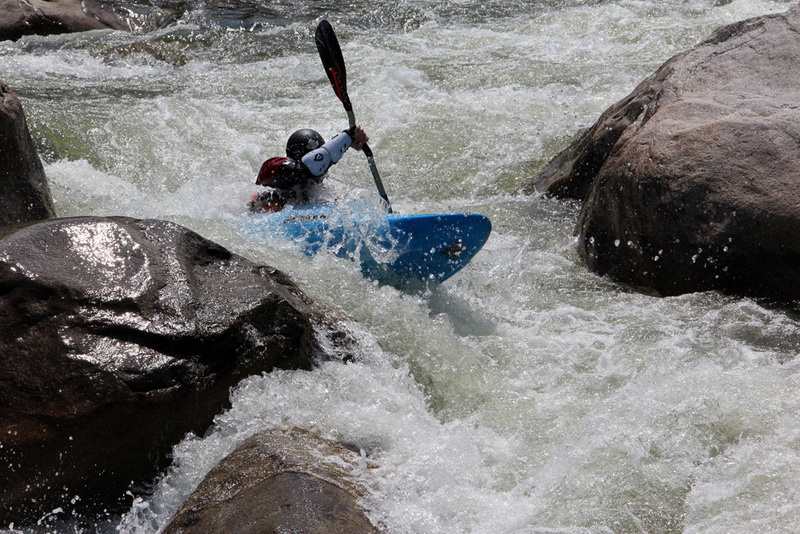 It’s easy to get a run so dialed in that you no longer think or challenge yourself when you are paddling. You can get lulled into a “cruising” state of kayaking; and the perfect way to knock yourself out of that is a change of scenery! 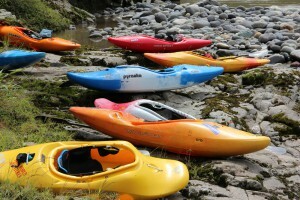 Giving the kayaks a rest while the kayakers eat lunch and enjoy a sunny day on the river. 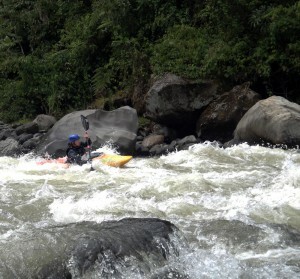 The great thing about paddling on new rivers is that you really can test yourself without stepping it up a grade. Again, when we are talking about the jump into the Class V realm, this is a much safer way to begin. Once you’ve run tons of new rivers at different water levels and begin to feel more and more comfortable with the new things you’ve seen, then go back to that home run, look at some of the Class V drops and see if your perspective has changed. If it no longer looks insurmountable and you can see the line and envision yourself styling it, well then, you are ready! And remember to never push it until you truly are ready. 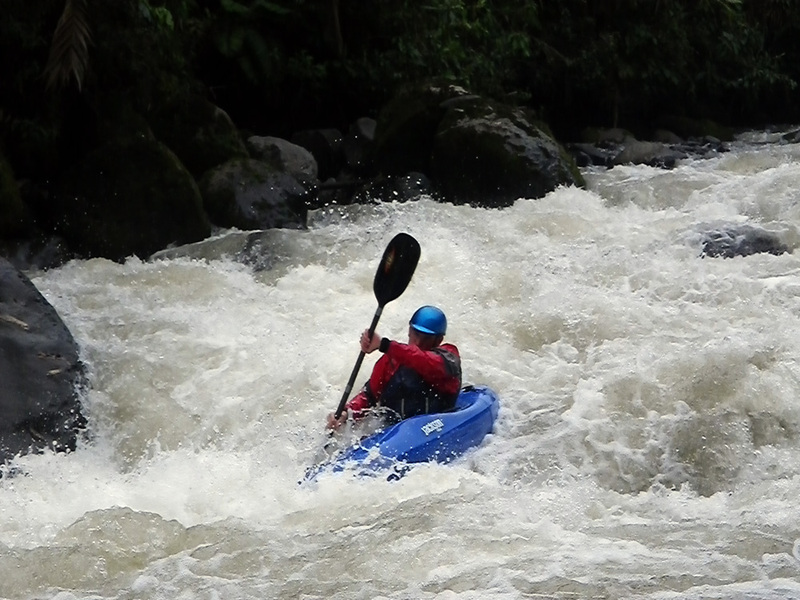 We all love kayaking because is is fun (remember SWA’s motto, “What’s Wrong With Just Fun“) and if you are scared or are getting yourself into trouble, it is no longer fun. So be safe out there, have fun, and go paddle some new runs!